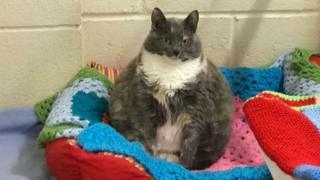 A plump pussycat who was returned to an animal shelter four times has finally found a home. Mitzi weighed almost 7.7kg (17lb) when she first arrived at Woodside Sanctuary in Plymouth, Devon, as a stray. The tubby tabby, dubbed "Britain's fattest cat", has since slimmed to 5.3kg (11lbs) and has been rehomed by the family of one of her old owners. "She's such a sweet cat," shelter manager Helen Lecointe said. "We really hope she's found her fairytale ending." Mitzi was rescued by Woodside Sanctuary in 2017 and staff said she had been "extremely unlucky" in her hunt for a forever home. "It's been ever so sad for Mitzi," Ms Lecointe said. "There was an owner death, a change of circumstance and one owner became very ill."
Mitzi's new owners had wanted to adopt her when their family member died but were unable to look after her in rented accommodation. The shelter said staff would be looking after Mitzi until April, when her owners were due to move into a new home. "We had offers from the US, Sweden and the Middle East, but we're so pleased that we've found an owner who already knows her and loves her," Ms Lecointe said. "It's very unusual for a cat to be returned this many times but sadly she's just been so unlucky." Nobody knows for sure how the nine-year-old cat became so big but shelter staff thought she might have been fed by people in several houses. "Like all cats it seems she was very successful at adopting people," Ms Lecointe said. "No-one owned her but everyone was feeding her."